True or false: How much do you know about seasonal allergies in children? Seasonal allergies, also called “hay fever,” can cause miserable, cold-like symptoms in your child: congestion, sneezing, runny nose and itchy eyes. But beyond the common symptoms, how much do you really know about seasonal allergies? True or false: Allergies are only caused by outdoor substances. True or false: Children who are allergic to just pollen will develop symptoms only during pollen season. True or false: If you don’t have seasonal allergies when you’re young, you will never be affected by them. True or false: There is no cure for seasonal allergies. 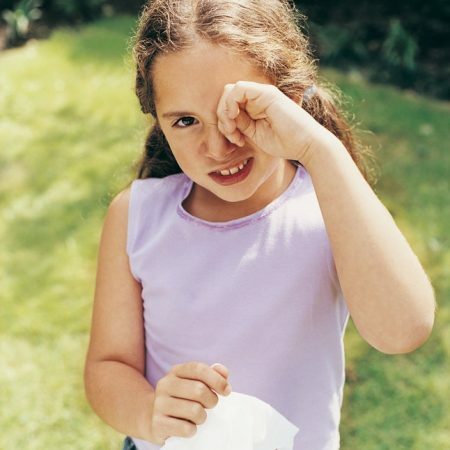 True or false: Children with allergies simply have to live with it (and carry a lot of tissues). True or false: Seasonal allergies are annoying for children but don’t really affect them. False: There are many substances that can act as allergens (allergy triggers). Indoor allergens include dust mites, cockroaches, pet dander and certain types of mold. Outdoor allergens include trees, grass, other types of mold and weed pollen. When children with allergies come in contact with these allergens, their bodies release inflammatory chemicals, such as histamine, that lead to the uncomfortable symptoms associated with allergies. This is why allergy medications use antihistamines to alleviate said symptoms. True or false: Children who are allergic to just pollens will develop symptoms only during pollen season. True: Children who are sensitive to pollens are not guaranteed to be sensitive to indoor allergens as well. Instead, they may be symptomatic only during pollen season. The flip side of this is that children allergic to indoor allergens will most likely experience symptoms year-round. However, children who only have pollen allergies that live on the West Coast may still suffer year round. This is because there is nearly always some type of pollen in the air. Thanks to the relatively mild winters, the trees, grass and weeds pollinate for much of the year. So what is the best time of year to count on some relief? November through January months tend to have the lowest pollen counts. False: There are many contributing factors that determine why one child will develop allergies and one will not, including variabilities in environment, lifestyles and genetics. A child may not experience allergies at a young age but may develop them during later childhood or the teen years. True: Doctors cannot make a person “unallergic” to allergens. False: While there is no cure for allergies, there are ways to alleviate your child’s symptoms. The first step is to reduce or eliminate your child’s exposure to allergens. However, that isn’t always possible, especially for allergens we have no control over, such as pollen. Talk to your child’s pediatrician about using decongestants, antihistamines, nasal-spray steroids or leukotriene inhibitors (a daily medication for persistent allergies that relieves symptoms and prevents asthma attacks). Your pediatrician will probably make a diagnosis based on symptoms and a physical exam. In some cases, your child may need to visit an allergist for additional testing. False: Untreated allergies can negatively affect your child’s functioning. Symptoms can make it difficult for children to concentrate and focus, which affects their ability to learn and play. Children who are severely decongested will also have trouble sleeping, leading to daytime sleepiness and fatigue (and possibly crankiness). In severe cases, allergies can even cause an asthma attack. So if your child seems to be suffering from allergies, talk to your pediatrician or family physician to find out how you can get him or her some allergy relief. Learn more about Pediatric Allergy and Immunology at Mattel Children’s Hospital UCLA.